Sri Lankan apparel manufacturer Hela Clothing Group yesterday announced that it had secured a capital infusion of Rs.1.2 billion, by way of a mix of shareholder and new private equity investment funds from a private consortium, whose lead investor has a wide portfolio, including private equity investments in the fashion and retail space. Subsequent to this capital infusion, A.R. Rasiah, who has been a long-standing Director of the company, will assume the role of Chairman, a media release by Hela Clothing said. 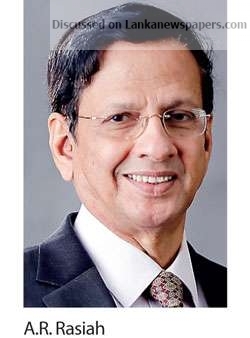 Rasiah was a former Finance Director at Nestle Lanka PLC, former Senior Director at Nations Trust Bank PLC, former Chairman of Atlas Axillia (Pvt.) Ltd and a Director of many other listed and non-listed entities. Overwhelmed by the interest from private equity funds to invest in Hela, Rasiah together with the company’s board of directors said they were pleased to secure an anchor partner with a wealth of retail and supply chain expertise. “The focus for the past 12 months was to rightsize the business and drive free cash flow generation through operational excellence, prudent cost management together with customer and supply chain optimisation strategies. With the business now having made significant progress in those areas, the focus is now around balance sheet strengthening, both through raising equity and building cash reserves through operations,” said Rasiah. Hela plans to use this capital infusion on several fronts. The majority of the proceeds will be used to repay debt and replenish working capital, thus strengthening the company’s balance sheet. The balance of the funds will be utilized to fuel growth by enhancing and expanding its manufacturing footprint in Africa and for further operational streamlining through investments into IT and innovation, beginning with the group-wide ERP system being upgraded in partnership with SAP solutions.